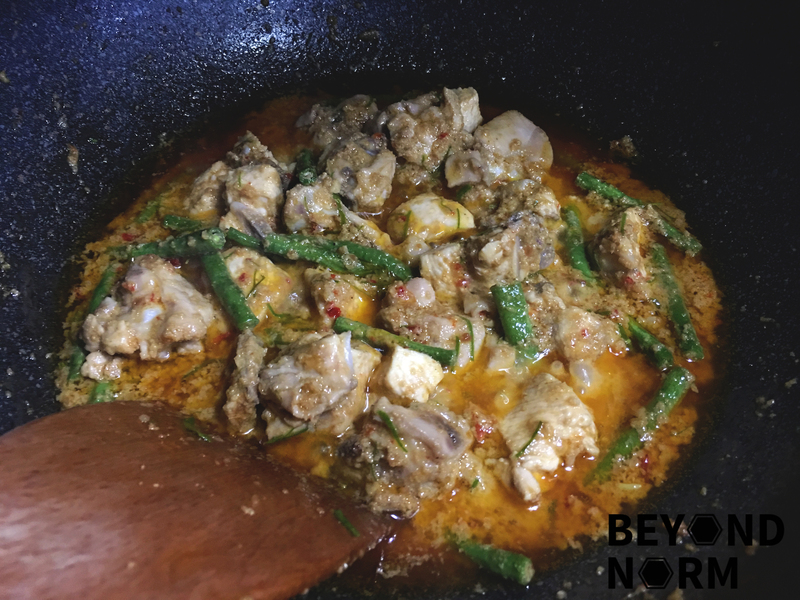 One reader asked if I have a recipe for a Thai dry curry and straightaway, the Panang Curry (sometimes known as Penang Curry) came to mind. Bear in mind that this dish originated from Thailand and not Penang. Basically this curry is fried in coconut cream and not boiled. Typically, this dish uses beef and no vegetables (except the kaffir leaves and basil). 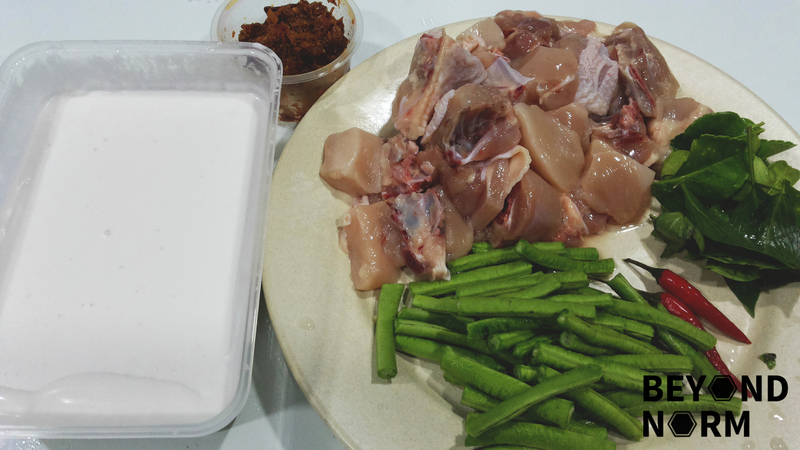 In this recipe, I am using chicken, and as I do not have any vegetable dish for tonight’s dinner, I have decided to add some long beans too. Interesting… In Thai food, the only two curries which uses peanuts are Panang Curry and Masamam Curry. We love this Panang Curry for it is richer, sweeter and creamier than the Thai red or green curry. A must try!! Clean and cut chicken into bite size pieces. Set aside. Heat up your pan on medium heat then add ½ cup of the coconut cream. It should sizzle right away and boil. Add all the curry paste and peanut paste and mix well. 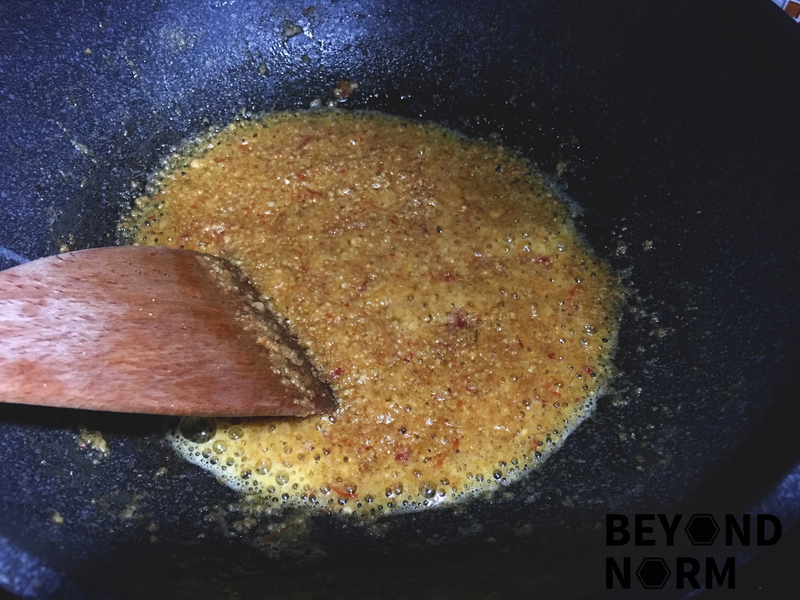 At this juncture, if you would like to increase the spiciness, you can add in the cut chillies. Fry the paste to keep the paste dry, but not too dry that it sticks and burns. If it is too dry you might want to add a little bit of coconut cream every minute or two. Keep stirring. After about 4 minutes, your paste should start to smell really good. You will start to see a lot of oil rising to the top, especially where it is bubbling. Add the chicken and stir to mix the curry paste with the chicken. After about 2 minutes, add the long beans and stir to mix well. 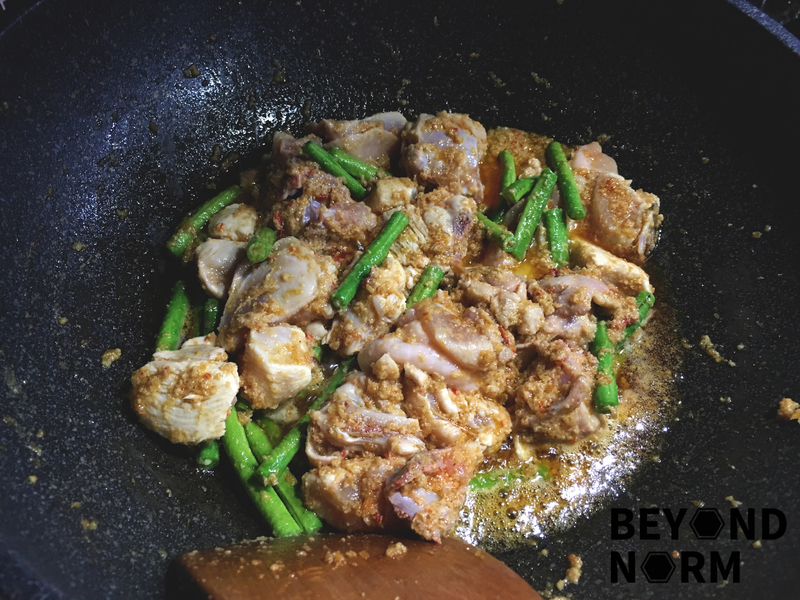 Once they are cooked, add the shredded kaffir leaves, fish sauce (add 2 tablespoons first) and palm sugar. Simmer for another 2 minutes. Add a bit more of the coconut if the dish is too dry. If it is not salty, add in some more fish sauce and mix well. Top with some thickened coconut cream and then garnish with a few leaves of basil and serve.